Here is the good news: Jurassic World: Fallen Kingdom is more fun than Jurassic World. It is not exactly a high bar, but still a welcome surprise. In the hands of a new director, J.A. Bayona, with Chris Pratt’s high-wattage charisma on full blast and a fair amount of self-aware humour intact, there are certainly worse ways to spend a couple hours in the cinema. Mind you, this movie is pretty ridiculous and the script (from Colin Trevorrow and Derek Connolly) is not very clever — I found myself rolling my eyes almost as frequently as I found myself smiling with genuine delight. 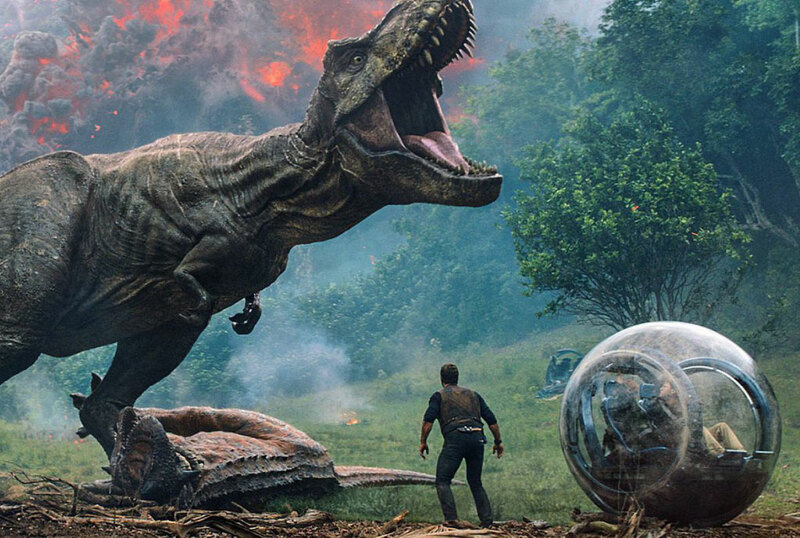 Jurassic World: Fallen Kingdom will not stand up to rigorous scrutiny, and yet, it is kind of an enjoyable, preposterous and thrilling ride that ticks through nostalgia beats such as a shopping list. After a very solid, and scary, beginning, with pouring rain and genuine suspense as some scientists venture back into the defunct Jurassic World to retrieve a dinosaur bone, a helpful newscaster orients the audience with a whole lot of exposition: It has been three years since Jurassic World closed. Most importantly, a dormant volcano has come back to life on the island and is about to cause an “extinction level event” that will wipe out all the remaining dinosaurs. The question of whether or not to let the dinos go extinct again has become a national debate and Bryce Dallas Howard’s Claire is leading the charge to try to save the animals. This is all a precursor to the dinos coming to the mainland. If you are thinking, “I’ve seen this movie before,” just wait, it gets so much more derivative than you would ever imagine possible. Bayona, who also directed The Impossible and A Monster Calls, is good enough to pull it off. It is the main reason Fallen Kingdom is entertaining despite itself, but it is a shameless strategy that can only work so many times.